At The Scarborough Fair Collection there are two Wurlitzer organs that will be featured during open days and weekly Wednesday afternoon tea dances. The Wurlitzer organs in the collection were originally installed in the Granada Theatres at Greenford and Mansfield respectively. Both instruments were of 3 manuals and 8 ranks, although the rank specification of the two instruments couldn’t have been further apart. The Greenford Wurlitzer comprises English Horn, Tuba Horn, Diaphonic Diapason, Tibia Clausa, Saxophone, Gamba, Gamba Celeste and Concert Flute, whereas the Mansfield organ has Style ‘D’ Trumpet, Open Diapason, Tibia Clausa, Clarinet, Violin, Violin Celeste, Vox Humana & Flute. It is interesting that both instruments had solo scale 15” Tibia ranks, despite being very different instruments. These two Wurlitzers have been installed complete as built, although the 16’ Tibia bass pipes of the Mansfield organ are un-enclosed and are placed either side of the stage proscenium. 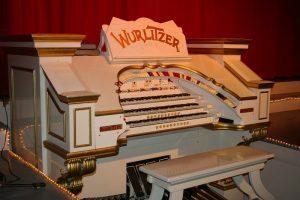 Three ranks of pipes, an orchestral Marimba and three Accordions were added to the Greenford Wurlitzer when it was installed in its previous home – “M” Ranch, Sutton in Ashfield. These have been removed and the organ has been restored to its original specification. The orchestral Marimba has been also removed (and is available for sale) and a genuine Wurlitzer Marimba has been installed and sounds well. 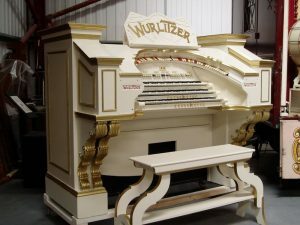 It is planned to expand the Wurlitzer presentation at the new complex by the installation of the 4 manual console formally installed at the Cincinnati Music Palace, which will not only play the pipes of the two Granada Wurlitzers but also additional pipe-work which has been imported from the USA.